It was July when I first wrote about dogs brought into Canada by Save A Puppy that were rejected at the border. In the past three months what I have seen has me even more troubled. After the instance of the dogs being rejected it was my hope that Save A Puppy would change its ways. The rescue (Save A Puppy maintains it is not a rescue, I will simply refer to it as such since that's what I consider an individual/organization that has imported over 150 dogs into Canada this year) expressed it had listened to the backlash and concerns, learned from the experience, and would reform. Sadly, none of this has happened. Save A Puppy continues to bring mass transports of dogs into this country with little to no regard for their well being and health. The most shocking thing I have learned in the last three months however, is several of Save A Puppy's animals have died. It is unacceptable. "This is a lesson to me... The transition for a puppy can be overwhelming for a puppy... Transition a puppy into a new country a new home a new world...needs to be done with caution...". 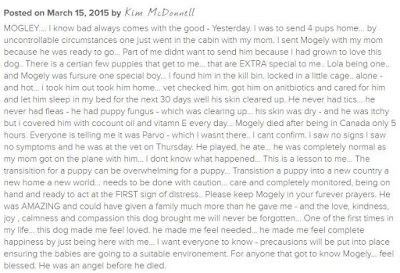 Empty words when just 3 weeks later, 6 dogs were crammed into one crate. Someone please explain the, "caution" and, "care" that was taken after the incident in March. Please note, the above cases are only the ones that have been verified through documentation and speaking with the vets, airline, witnesses, and what Save A Puppy has posted. THESE ARE ONLY THE CONFIRMED CASES. I certainly hope no other dogs have died, but I would not be surprised. The only party that has for the most part remained silent on the issue of the other 10 deceased dogs is Save A Puppy. Throughout the past three months Save A Puppy supporters have accused me of lying and bullying. They have said I have nothing better to do with my time, "Why don't you actually do something instead of just attacking Save A Puppy?!" I am doing something. 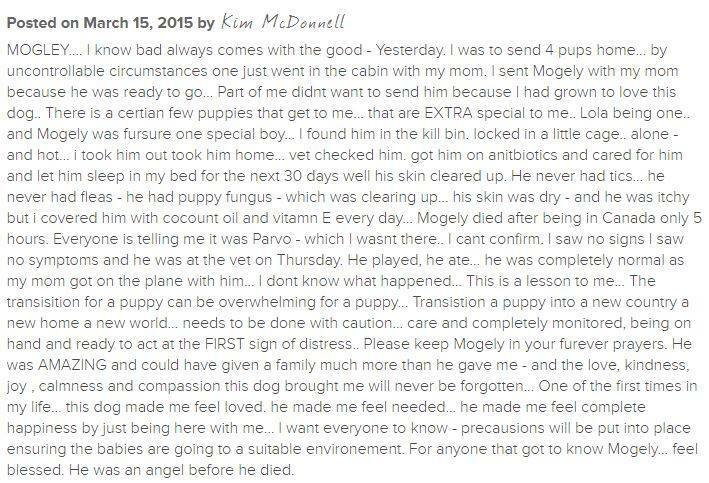 I am speaking up for these deceased dogs in the hopes not one more dies on this rescue's watch. Perhaps these supporters know nothing of the last three months? If they do I am extremely concerned they are concentrating their efforts on defending Save A Puppy instead of calling for change at the rescue in memory of these dead dogs. It is next to impossible to believe that Save A Puppy has the animals' best interests at heart when its animals are consistently dying and next to nothing is being done to prevent it from happening in the future. People will of course argue that Save A Puppy has had many successful adoptions. That is very true and commendable, but at what cost? Unfortunately that argument does not speak to the dogs that have died. I guess that's just part of the rescue game when animals are treated as a commodity.